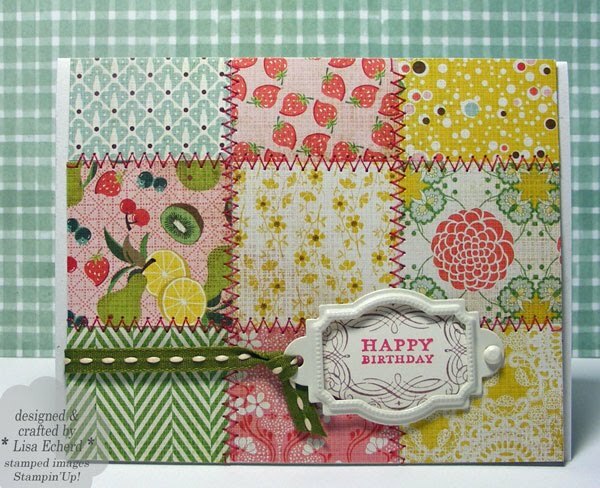 Combining quilting and card making? What's better! These little squares are all different papers from Basic Grey's Nook and Pantry paper pad. Paper pads are smaller versions of the patterns on 12x12 sheets so they are perfect for cards. I adhered the squares with a single piece of adhesive in the center of each so there would be no adhesive on the edges where the sewing machine needle would go. All squares were cut the same size so I could play with the arrangement and adhered to a piece of plain white cardstock. I cut them down to size before sewing. Threads are tucked to the back with photo split adhesive. Vintage Labels from this years SU! Sale-a-bration sets fits great in this large Hodgepode hardware frame. Well, I'm doing a little work in my scraproom while it is cool up here and then off to clean up the sunroom! You know how much I love to clean (insert heavy sarcasim here). I do love to get the sunroom back in use after a cold winter so it will be worth it. Ingredients: Stamps: Vintage Labels by Stampin' Up! Cardstock: Naturals White by SU!